I'm not sure how a cat person can also be so taken by cute mice but I am, especially those I find on Penny Black stamps. Hmmm, now that I think of it, I love Penny Black cats, too. :-D Anyway, today felt like a 'cute mice' day so how's this one? This time I stamped on matte photo paper so there's a very slight shine to it, but it can still be colored with alcohol inks. I used a combination of Copics and ProMarkers and, truthfully, the ProMarkers work a bit better on the photo paper. I cut it and the two other 'layers' with rectangle dies; the smaller one (red) from QuicKutz and the largest ones from Spellbinders. Those really aren't layers because each rectangle is inlaid into the larger one around it so the entire image piece is only one layer, not four. I turned it and adhered it to some deep red CS (on an angle), then added the red ribbon before putting it onto the card base. The wreath was in my stash of Christmas embellies. The sentiment is also from Penny Black. I love all of Penny Blacks critters! But these sweet mice are just adorable hanging in their stockings! Love your card! Fun card Connie, the mice are indeed super cute. Wonderful wreath ornament! 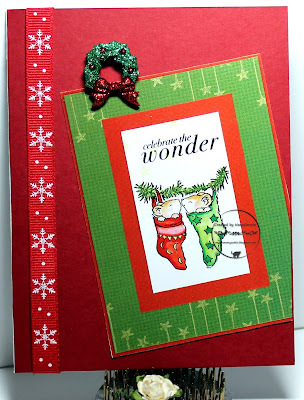 How pretty this looks in the traditional Christmas colours, many thanks for joining us at penny Black and More challenge. The little mice are so sweet! Love the look of your Christmas card. Thanks for sharing at Jo's Scrap Shack! Such a sweet card and beautifully made in the traditional Christmas colours. A lovely card, thanks for sharing with crafting from the Heart! So very cute, loving the sketch and fabulous Christmas colors! Thanks so much for playing along in our CAS challenge at Penny Black and More! Lovely seasonal card! Mice are too cute! Thanks for joining in with the PaperGirls!